Of course Athens is not the capital of hot dogs but it is the city where Mr B’s Dog ‘n Go belongs. This spot is located in the central square of Kypseli (one of the oldest neighborhoods of Athens) and though I live a little bit far from there I often visit the area to enjoy a walk at Fokionos Negri and a hot dog. The first reason I go there again and again is the spicy, homemade chili. The second reason is the also homemade caramelised onions and all the combinations that can be made with the ingredients. 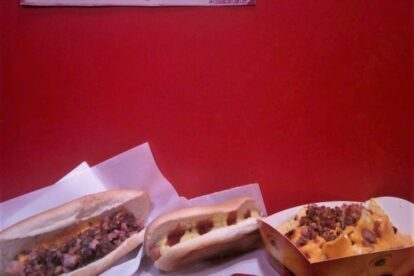 My favorite is the hot dog with chili, cheddar and onions. It’s kind of too much meat but it’s really tasty. Trust me! You can also order the chili as a small portion but don’t forget to put some cheddar on it or combine it with nachos. Other than hot dogs, Mr B’s makes baguettes with tuna or chicken, cheese pies and absolutely delicious crispy donuts. If you happen to be in Kypseli or if you are craving a delicious chili and hot dog, Mr B’s dog n go is a guaranteed choice!